A funny, heartwarming, and heartbreaking contemporary story about three boys, one teacher, and a day none of them will ever forget. Everyone knows there are different kinds of teachers. The boring ones, the mean ones, the ones who try too hard, the ones who stopped trying long ago. The ones you'll never remember, and the ones you want to forget. Ms. Bixby is none of these. She's the sort of teacher who makes you feel like school is somehow worthwhile. Who recognizes something in you that sometimes you don't even see in yourself. Who you never want to disappoint. What Ms. Bixby is, is one of a kind. Topher, Brand, and Steve know this better than anyone. And so when Ms. Bixby unexpectedly announces that she won't be able to finish the school year, they come up with a risky plan--more of a quest, really--to give Ms. Bixby the last day she deserves. Through the three very different stories they tell, we begin to understand what Ms. Bixby means to each of them--and what the three of them mean to each other. 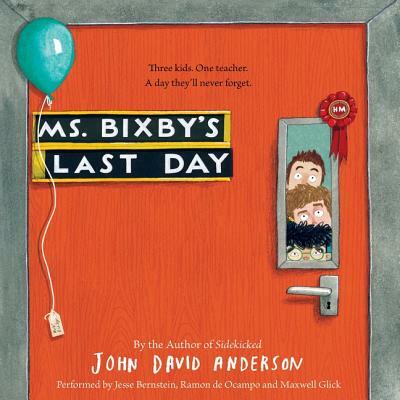 John David Anderson is the author of Sidekicked and The Dungeoneers, proven winners with middle grade readers, and Ms. Bixby's Day is no exception.